On Thursday May 12, Western Resource Advocates joined others to celebrate HB16-1005, legalizing the use of rain barrels, becoming law. But not everyone believes the governor has made all the right choices on water. 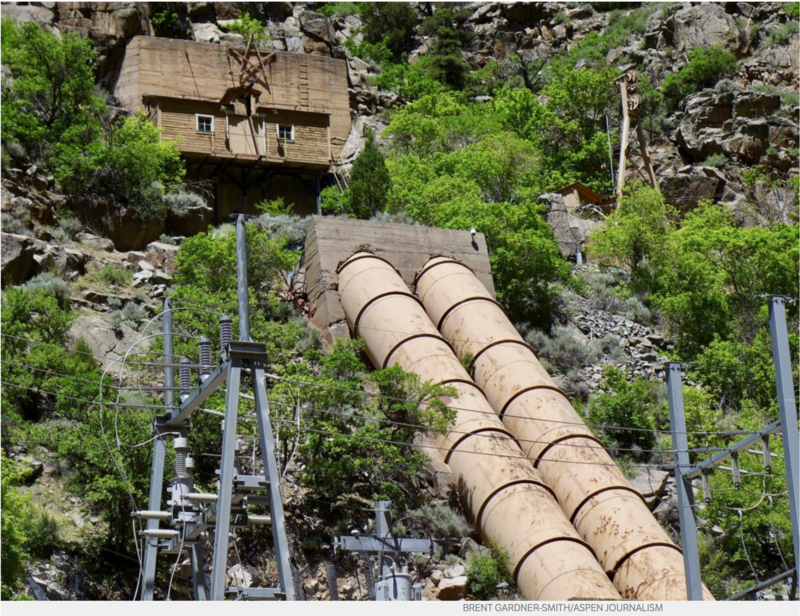 Colorado still faces daunting water-supply challenges. Some say Hickenlooper should have done more to promote dams and reservoirs and there’s no clear way to pay for the ambitious state water plan he fostered. 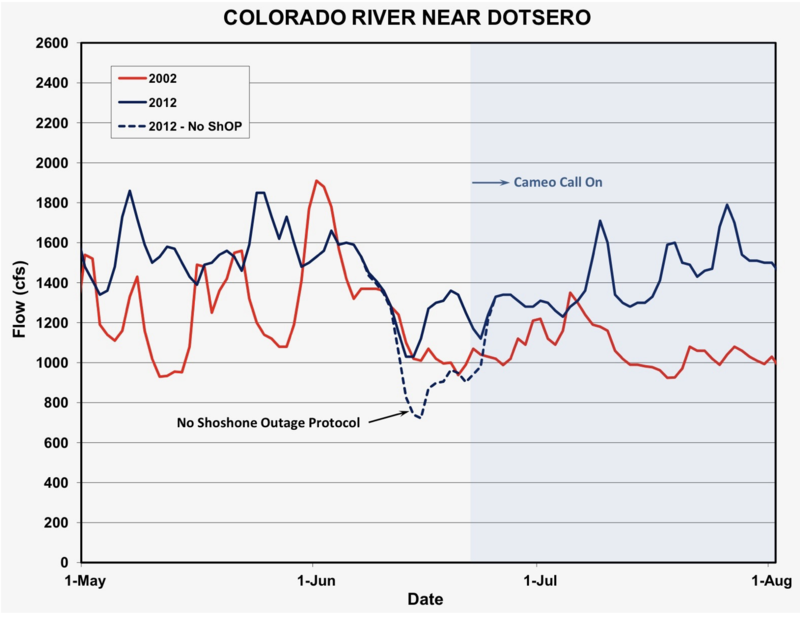 Still, many give Hickenlooper credit for reshaping how Colorado deals with water. “He was the first governor to put water at the forefront,” said veteran northern Colorado water manager Eric Wilkinson. Hickenlooper’s legacy may depend on what is done with the water plan that he is leaving for his successor. Colorado Politics talked to members of Colorado’s water community to see what they think his legacy in water looks like – and the governor weighed in on that, too. 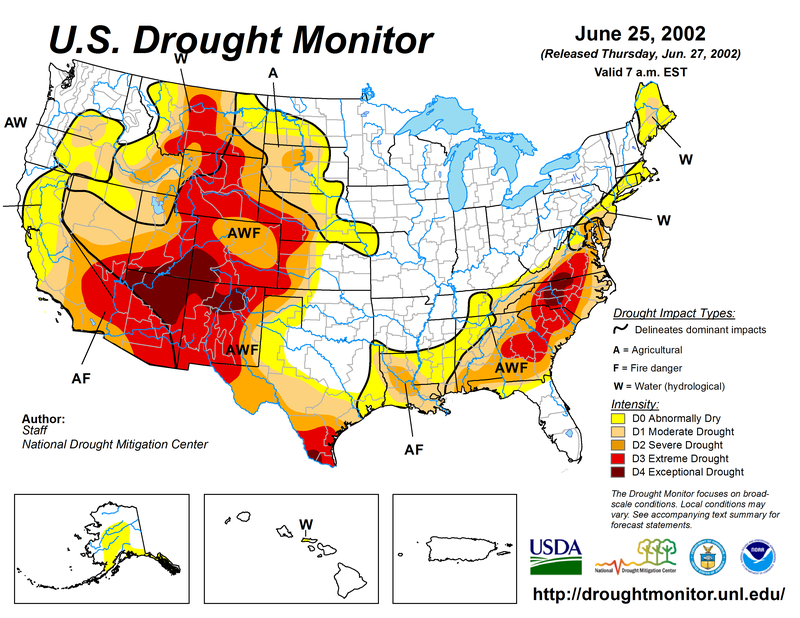 US Drought Monitor June 25, 2002. When Hickenlooper became mayor of Denver in July 2003, the state was already entering the second year of a record-setting drought. Gov. Bill Owens, in his 2003 State of the State address six months earlier, claimed the 2002 drought was the worst in 350 years, with most of Colorado in what the U.S. Drought Monitor called “exceptional drought,” the worst stage in their rankings. So water got into the future governor’s mind early on, although as mayor, his control was limited primarily to appointing commissioners to Denver Water, the state’s largest water utility. But as he saw it, he wasn’t dealing with just Denver’s water. It was water that belonged to the entire state, he said. In the 2005 session, the General Assembly approved a law setting up groups known as basin roundtables, which divided Colorado into nine regions, each representing a major river, plus one for Denver. But the groups weren’t required to work with each other. There were differences among the regions, including claims from the Western Slope that the Denver area was seeking more “transmountain diversions” to channel water from the Colorado River and other western waters through the mountains to the Front Range. That claim still sticks today. Two Forks was a proposed dam on the South Platte River that would have created a million acre-feet reservoir, flooding 30 miles of canyon from Deckers south to the river’s confluence with its north fork. Advocates said the project was vital to supplying growing metro Denver. 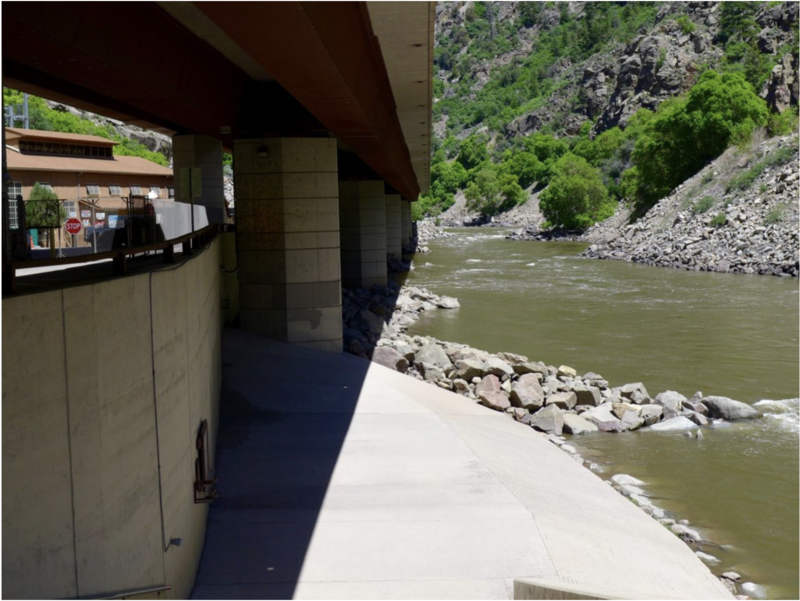 But environmentalists sounded the trumpets, complaining of the potential drowning of much of Cheesman Canyon with its prime fishing, hiking and kayaking areas, and the Environmental Protection Agency vetoed a permit for the project in 1990. Denver Water, which exhausted its appeals of the rejection in 1996, was forced to shift to conservation rather than looking for major new water supplies from storage. That’s the environment that Hickenlooper walked into as mayor. And that’s when his water legacy started, says Eric Kuhn, who has spent 40 years working on the Colorado River, including as general manager of the Colorado River Water Conservation District. It was then, he said, that the groundwork was laid with Denver Water board members to build cooperation with Western Slope water providers. Knowing that Denver Water controlled a quarter of the state’s water supply, it meant new conversations with the Western Slope water community. 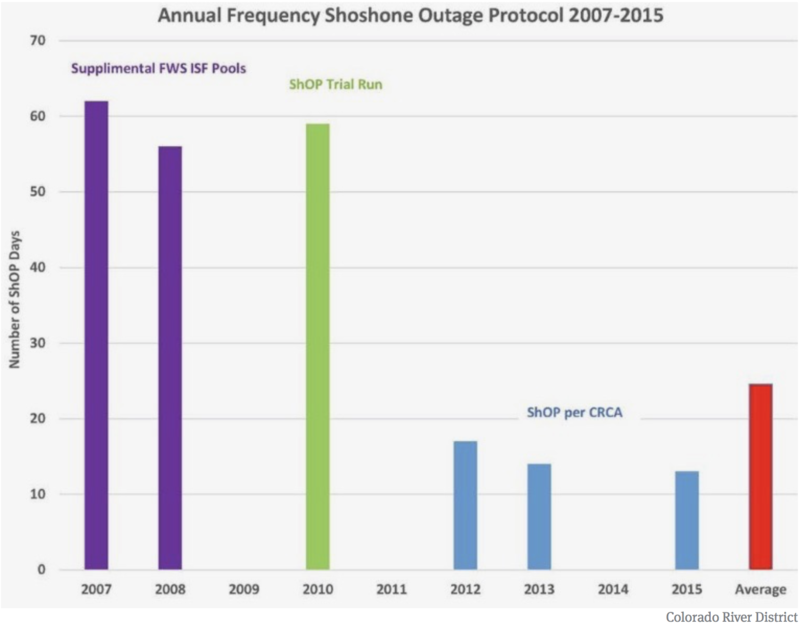 Those discussions started in 2006 between Denver Water and 42 Western Slope partners, ranging from water providers to local governments to ski resorts. Hickenlooper got one other big advantage during his time as mayor: The Denver Water board selected a new general manager, Jim Lochhead, who would continue the agenda set forth by the board and with Hickenlooper’s vision in hand. That took place in 2010. Hickenlooper “made very thoughtful appointments” to the Denver Water board, including people like Tom Gougeon, John Lucero and George Beardsley, Lochhead told Colorado Politics. They were “really strong leaders with the ethics for moving Denver Water forward but with having us take a far-sighted approach with the Western Slope,” he said. Hickenlooper says he tackled water issues again shortly after being elected governor in November 2010. The state found itself in another multi-year drought starting in 2011, and that’s when Hickenlooper asked if drought would be the new normal and how Colorado would deal with it. He talked to other governors to research the best practices they employed, and found that what Colorado lacked was a comprehensive water plan, which he called a “serious vacuum” in the state’s framework. It was a risky proposition, given that Coloradans were historically polarized around the issue of water, he said. There were things – like boosting water conservation – that he knew would be difficult. 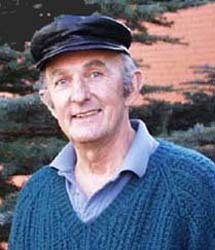 He knew rural Colorado’s farmers and ranchers did not want to be told what to do. “We couldn’t deny people the right to sell their property,” he said, referring to water rights. But the plan would look at how to incentivize farmers to at least temporarily lease their water rather than sell. With the traditional east-west divide over water evolving with the completion of the Colorado River agreement, the time to strike came early on in Hickenlooper’s first term. He began asking his cabinet about a water plan. According to James Eklund, who first served as Hickenlooper’s senior deputy legal counsel and then as director of the Colorado Water Conservation Board (CWCB), the governor was asked if he was willing to spend his political capital by wading into the water wars. After the discussions with the other governors, that wasn’t going to be Hickenlooper’s way. “We have no choice but to treat this as a serious discussion” and to engage in strategic planning, according to Eklund. Hickenlooper – a former restaurateur – looks at everything through a business lens, Eklund said. That meant that if water is so important to Colorado’s bottom line and there isn’t a strategic plan, that’s not acceptable. In November 2015, the water plan was unveiled after more than 30,000 public comments from all over the state. “We wanted to make sure all the interests were represented, not just conservation,” Hickenlooper said. “We also put in water storage,” meaning reservoirs, but that also ruffled the feathers of environmentalists, he said. Hickenlooper said he was most pleased with the ability of the basin roundtables – set up in that 2005 legislation – to take the long view, especially for groups historically polarized over water. 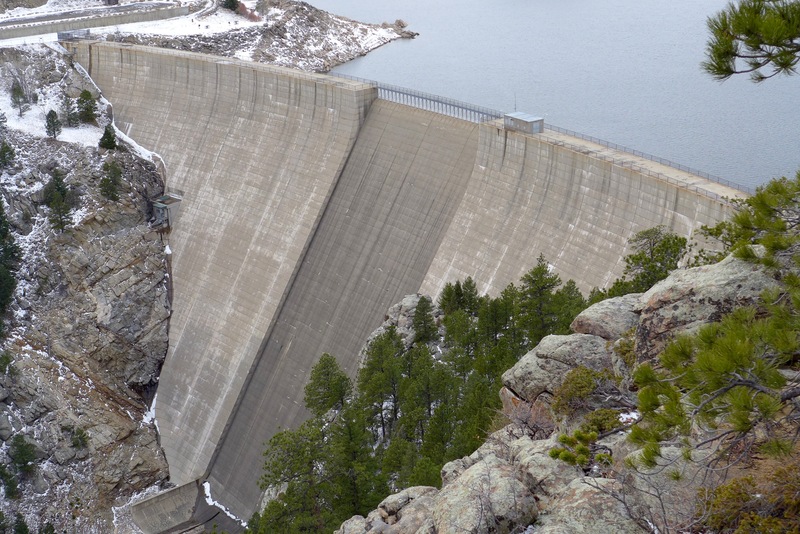 The water plan attempts to address what is now expected to be a 1 million acre-feet shortage of water in Colorado by 2050, based in part on projected population growth of another 3 to 5 million people on top of the state’s current population of 5.6 million. It focuses on a number of strategic goals: 400,000 acre-feet of water to be gained through conservation, another 400,000 to be gained through new or enhanced storage (dams and reservoirs), and the rest from other steps, such as agricultural water sharing. The plan has its detractors who have criticized it for lack of specific objectives in how to achieve those goals. And some lawmakers believe the General Assembly has been shut out of the process and that storage gets short shrift. Sonnenberg disagrees that the water plan is a positive legacy for Hickenlooper. “He tried to put the plan together and it didn’t get a lot of attention other than from the environmental community that wants to make sure we leave more water in the rivers. If you want to be a water leader with a water legacy, you must support water storage that is paid for by the communities planning for growth,” Sonnenberg said, citing the Northern Integrated Supply Project (NISP), which plans two reservoirs – Glade, near Fort Collins and Galeton, east of Greeley. 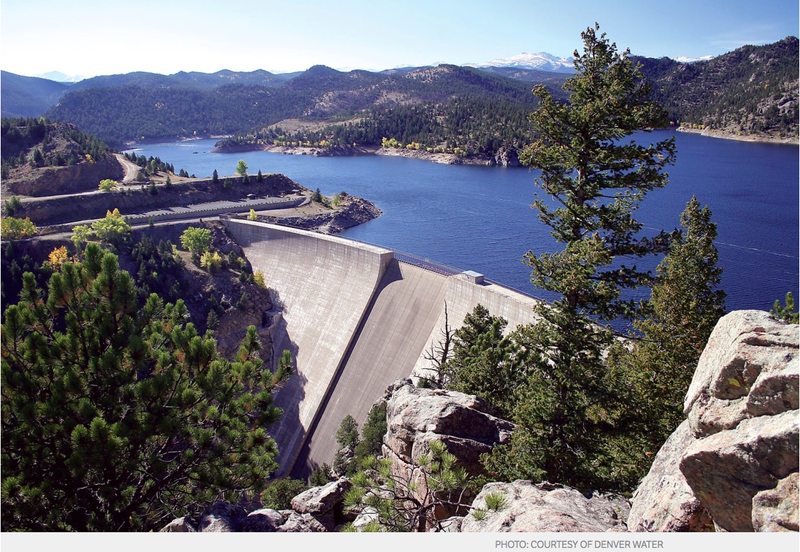 Sonnenberg complained that the governor has not yet endorsed those projects, although Hickenlooper did endorse two other reservoir projects two years ago: Chimney Hollow, near Loveland, and expansion of Gross Reservoir, near Boulder. But Eric Wilkinson, who recently retired as general manager of Northern Water, which runs NISP, does believe in Hickenlooper’s water legacy. “He was the first governor to put water at the forefront,” Wilkinson told Colorado Politics. He was pleased with Hickenlooper’s endorsement of Chimney Hollow, a Denver Water reservoir project, which he said tells federal agencies that the project has cleared Colorado’s permitting and is ready to go forward. That was part of the state water plan, too, Wilkinson noted. ilkinson also pointed to the people Hickenlooper put in charge of water issues as part of the legacy: Stulp, Eklund and Becky Mitchell, the current head of the CWCB; and both of his heads of the Department of Natural Resources, first Mike King and now Bob Randall. The timing was right and the leadership was right, Stulp told Colorado Politics. Hickenlooper saw what had been taking place for the past seven to eight years, after the formation of the basin roundtables, which came up with projects for their own regions. The time was right to pull all that together, Stulp said. Eklund, now with the law firm Squire Patton Boggs, is still involved in water issues, partly as Colorado’s representative on the Upper Colorado River Commission. He said Hickenlooper’s legacy isn’t only about the water plan; it’s also where he positioned Colorado internationally on water issues. Colorado’s position as a headwater state that provides water to 18 downstream states and Mexico means “we punch above our weight on water policy,” Eklund said. The eyes of the water-stressed world are on the Southwest United States. Colorado finally has a platform in that discussion by coming up with the water plan, which he called a “gold standard” for water planning. Other states and nations can look at what Colorado is doing and judge for themselves, he said. Colorado now speaks with one voice on water, said Mitchell, who was in charge of water planning prior to becoming the CWCB’s latest director. “The default starting point now on water talk is cooperation, not confrontation,” she told Colorado Politics. Hickenlooper told Colorado Politics he hopes the next governor recognizes the funding gap for implementing the plan. The General Assembly has so far devoted about $17 million over the past two budget cycles to funding projects in the water plan, but it’s a drop in the bucket compared to the need, which is estimated at around $20 billion. Water providers are expected to shoulder most of that, but the state’s obligation is expected to be around $3 billion, at $100 million per year for 30 years, starting in 2020. No one, including Hickenlooper, has come up with a solid plan for where that money is coming from. Lots of ideas have been floated, such as changes to the state’s severance tax structure on oil and gas operations – a no-go with Senate Republicans – bottle taxes, water tap fees and the like. That political courage, and part of the legacy, as Lochhead sees it, is that Hickenlooper opened the door for the next governor to come in and pick up where Hickenlooper ended and made it a little safer for a governor to jump into water issues. 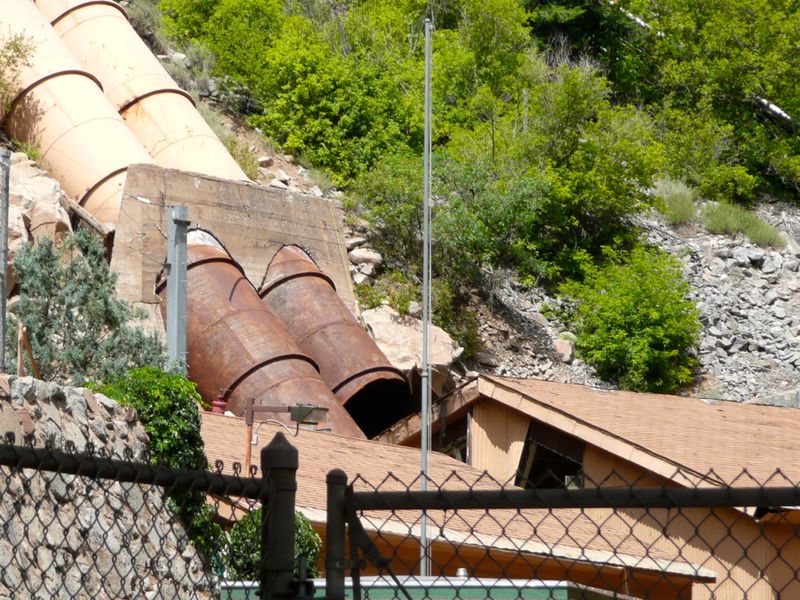 So how does Hickenlooper view his legacy in water? Yampa River Basin via Wikimedia. Less understood, Mueller said, is the Colorado River District’s stake in power generation at Glen Canyon Dam, where water levels are coming perilously close to dropping below the intakes for the power plant. Mueller told his Steamboat audience that agricultural water rights continue to be of preeminent importance in the district. Lake Powell, backed up by Glen Canyon Dam, just above the Grand Canyon, is where the Rocky Mountain states, including Utah, Wyoming and the northern portions of Arizona and New Mexico store water to ensure they can meet their obligations to send water to the lower basins states including California, Nevada and southern New Mexico and Arizona. As of 1999 the reservoir was almost full. But subsequent drought years, notably 2002, drew the reservoir down. 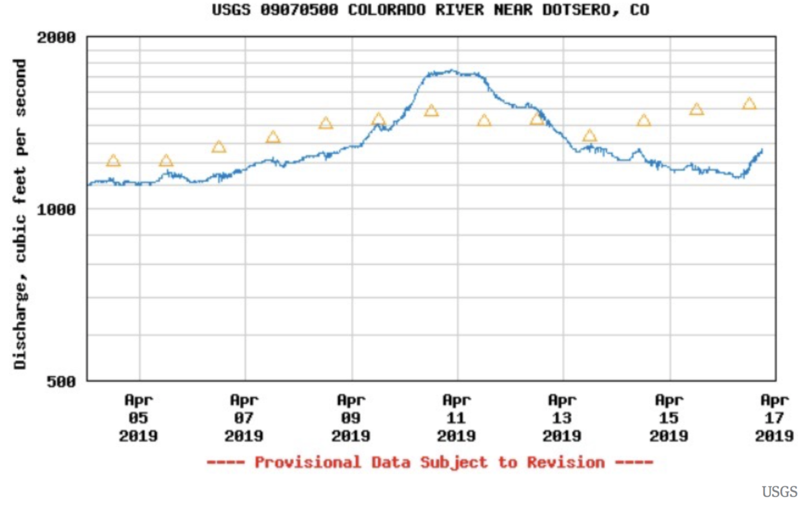 It took until 2012 to slowly re-build storage in the vast reservoir, but snowpacks in the Colorado Basin have not been generous since. As winters have grown milder, river flows are sapped and extended growing seasons are also resulting in plants absorbing more of the available water. “We’re working on cloud seeding, but you have to have storm events in order to hit them with the silver iodide,” Mueller said.